Today we were at Cusco railway station just after dawn for the train to Machu Picchu. The train is very comfortable and each carriage is self-contained with two staff, one man, one woman, on hand to serve food and take care of us. Of course, our main interest was the river we were to go past, a river that could sometimes be described as a torrent! The train leaves Cusco using a series of switchbacks. It goes up one line. Stops, Reverses up another. Stops. Goes forward up the next, and continues this until it is out of the bowl that houses the city of Cusco. 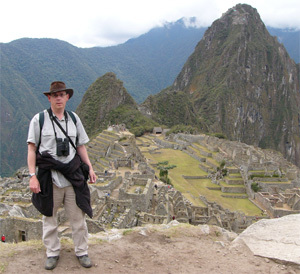 Then it's the run down to Machu Picchu through farmland and rocky gorges. Things got exciting when we reached Ollantaytambo Station, where we stopped along side the river. Our attention was attracted by a White-browed Chat-tyrant, a bird we had seen before, but this led to the finding of our first White-winged Cincloides and then came the shout, Torrent Duck! 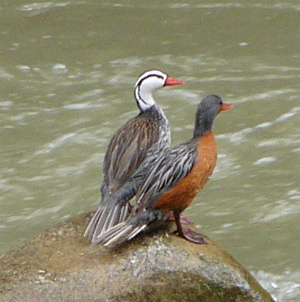 And there was one of the most-wanted birds of the tour, a male Torrent Duck on a rock in the middle of the river. A superb bird and one we had thought we might get only glimpses of as the train went past. 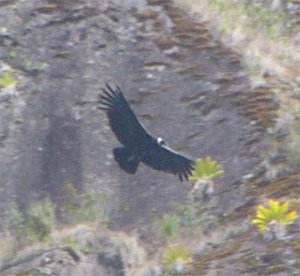 However, by the end of the day we had seen 17 males, 14 females and six young, some from the roadside in Machu Picchu. A bird we did only glimpse, but fortunately had seen before, was White-capped Dipper, not uncommon on the river but not easy to see from a moving train. After taking a short-cut through the tourist-catching sellers we got on the bus and were soon up at the famous ruins. Andean Swallows were common and we soon found one of our target birds, White-tipped Swift. A juvenile Mountain Caracara was about and seemed unafraid of all the tourists as it sat next to one of our group. After exploring the ruins and taking many photographs we went for lunch. As we ate and looked out of the window we added another bird to the list: White-winged Black-tyrant. Then it was time for a short walk down the road to hunt for Inca Wren. Frank warned us that we had to be quick when the bird came in and that it moves a lot and stays low and undercover. A few minutes later we were watching a beautiful Inca Wren feeding happily in a tree above our heads showing very well! We took the bus back down into the valley and were dropped off by a bridge over the river with the aim of walking back to town. This was a good idea! First we had Mitred Parakeets flying past, then found a nesthole of Golden-olive Woodpecker, with an adult flying to and from it and a juvenile looking down at us. As we enjoyed these birds some tanagers were spotted in a nearby tree and yet more species were added to the list: Golden-naped Tanager and Silver-backed Tanager. By the railway we added Inca Flycatcher and White-eared Solitaire, then the bird we all wanted just because of its name: Oleaginous Hemispingus. Then a warbler was found and we carefully examined its supercilium and so had our first Pale-legged Warbler. Torrent Ducks were seen well on the river and a pair of Variable Antshrikes added to the antbird list. Some flowering trees attracted hummers, first a Gould's Inca, then Purple-throated Sunangel, and then the endemic Green-and-white Hummingbird. We also admired a fine Black-chested Buzzard-eagle as it flew across the road and against the cliffs, and then Jon shouted Andean Condor. Frank's face when he saw Jon was right and that bad weather higher up had forced two condors low down, was was a picture! The final highlight of the day was on the train back to Cusco. The sound of piped Peruvian music over the intercom turned into Kylie Minogue and the young lady cabin crew member walked down the carriage modelling some alpaca clothing. Then the man followed, and this carried on for almost an hour. A fashion show on the train! Lots of clapping, cheering and photographing ensued! A great way to pass the time when it is dark outside.